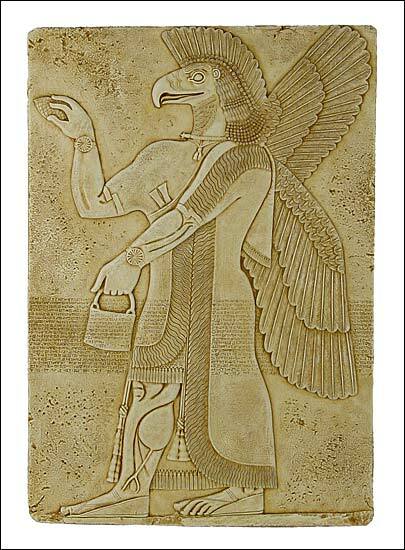 Assyrian eagle headed spirit, Assyrian art. New York Metropolitan Museum of Art, 865 B.C. The eagle-headed winged protective spirit shown here is known as an �Apkallu� spirit. The eagle-headed being touches traditions and beliefs that go back thousands of years in Mesopotamia, when similar images of terracota would be buried under doorways or set up at the entrances of palaces and temples. Their supposed magical strength would frighten away evil-wishing demons. In this representation, the eagle-headed being carries a bucket and a cone used to sprinkle, presumably, water from the bucket for purification. Across the body runs the so called �standard inscription� of King Ashurnasirpal which records some of the King�s titles and achievements and is repeated on many of his stone reliefs.